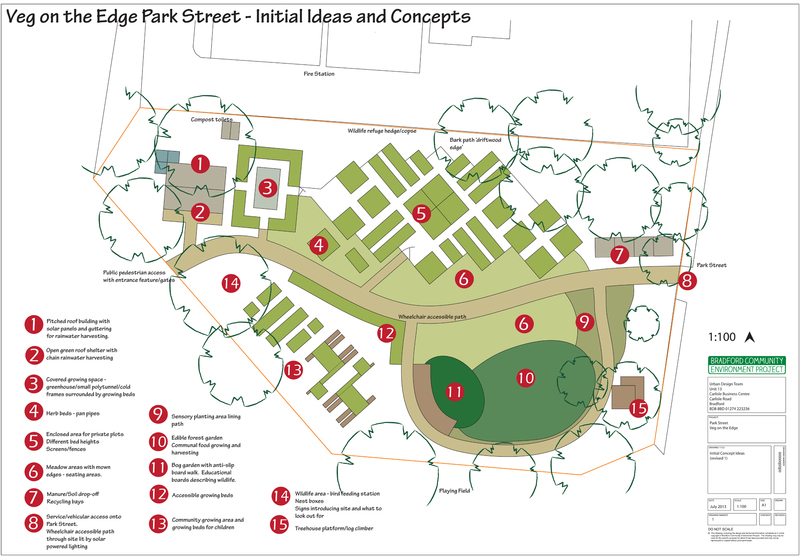 Following a successful application for Community First funding, VotE have been able to work with Bradford Community Environment Project (BCEP) to transform the group’s ideas into initial concept plans for the site. You can see these below, click on the image to see a larger version. We launched these plans at our Information Sharing Day on Sunday 6 October, where they prompted lots of discussion about all the different possibilities. It was fantastic to receive such a positive response and we received some really useful feedback from nearby residents. For those that couldn’t make this event we’d still love to hear from you. Click here to complete this quick questionnaire to tell us what features are important to you and if you would like to become involved in creating or using the food garden. This entry was posted in News on October 8, 2013 by Veg on the Edge.